When domestic cats utilize their claws, they make contact, rake downward inflicting three or four abrasions or lacerations. Big cats, or cats with big claws such as the bobcat, lynx and everything larger, apply their claws much differently. When these cats swat a victim, the paw is thrown much the same as a boxer throws a jab. One or two claws penetrate the flesh causing a deep puncture, rather than long claw marks. Whenever these claw marks are seen on animals, they are almost always the result of the cat attempting to hold on to the prey, and the lacerations are extremely deep. This did not appear to be the case with the young man in the photo. It isn't unusual for our veterinarians to treat hunting dogs after encounters with bobcats. 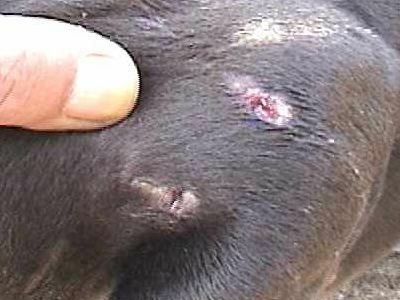 In most cases, the wounds appear more as the dog being hit in the face with a pitch-fork. If the dog is persistent and engages in battle, the cat will cut to the bone and often kill the dog very quickly. The attached picture shows my own hand after receiving one hit from a tame but angry bobcat. This picture was taken a week after the incident but it shows the damage one claw can do. A similar swat to the face by a big cat such as a cougar or leopard would be devastating. Concerning the attached picture, I might add that after this bobcat encounter, my hands were treated at our local emergency room. The attending physician counted more than fifty punctures on one hand and eleven on the other. In addition to the punctures, there were lacerations and two fractured bones. There was no indication whatsoever of any teeth pattern. Fortunately for the cat, I didnt take it personally. Since the canines of most cats are considerably different from dogs, the bite method is different as well. The shorter, and stronger canines of a dog are much wider at the base, allowing those two teeth to support the entire weight of the animal. In cats, except for the lion, the canines are longer, and much more fragile. They are also anchored into the skull differently. So, the cat relies on the claws to support its weight, and give it an infallible biting measurement. Unlike the dog, the bite of a cat never fails the intended target. When a bite is made, instead of ripping the area which has been punctured, the cat will make multiple bites. This eliminates the possibility of breaking a tooth. When I was growing up in Virginia, we had a small zoo nearby which my younger brother and I visited often. Though it was small, the zoo had an exceptional number of animals. In those days, liability was less of a concern, so all the cages and fences were placed in a manner where any visitor could readily touch any animal inside, if they were foolish enough. We were just foolish enough, so it was a sort of challenge to be able to pet each and every animal there. Needless to say, we experienced bites from almost every species of animal on the planet. That might even qualify us for Guiness's Book. On a positive note, it did allow me the opportunity to develop an understanding toward various animals. I would have to say, the rodents do deliver the worst, and most painful bites. I believe the ferrets have long sharp teeth, the squirrels and prairie dogs have razor sharp inscissors. These inscissors will either sever a small section of flesh, or leave a v-shaped wound which takes months to heal. I posed the question of big cat claw marks to another list that I subscribe to. This particular list is devoted to the husbandry of exotic felines and has about three hundred subscribers. Some are zoo-keepers, others are simply owners of various big cats kept as pets. My question was, anyone having an experience of being struck by the claws of a big cat, what did the wound look like. So far, I have received only about a dozen replies, but the answers have been unanimous. Whenever hit by the claws of a cougar or leopard, the mark invariably has been one single puncture rather than a series of rake marks. The only exception is from the rear feet, only seen when the cat has engaged in fighting with another cat. In those cases, the rake marks do occur, but since the rear claws are considerably duller, the wounds are much more of a gaping laceration, more similar to being sliced with a dull knife. Occasionally, these rake marks will be caused on a human when a tame or playful cat may leap on someone's back, but this is almost always through clothing. After taking a number of swats from medium sized cats, and many to my own face, I know the power they possess. When these cats do swat in a playful gesture, they do so without the claws extended. When the claws are extended, the swat is much harder, and the cat even has the ability to retract or extend the claw after it makes contact. In order for all four claws to make contact, the lower foot pad would also make contact, especially if the claws were less than fully extended. In the case of a leopard, that trauma alone would be a broken jaw or a very serious bruise. The additional comments which I recieved after my initial post to the U.K. list were for the most part the same as I recieved previously. That is, punctures as opposed to scratches. One gentlemen described to me how he had been "hooked" by a leopard when he was too close to its cage. This resulted in a "rip" in the flesh of his arm, more likely caused by his jumping back as it happened. This past Sunday, my wife was planting flowers near our bobcat's enclosure when a paw suddenly lashed out catching her forearm. She was understandably startled, even though the damage was minimal. When I looked at the marks, what I saw were two very noiceable dots into her skin, but nothing remotely resembling a scratch. Note, I say dots instead of punctures since I'm downplaying the incident. I seem to be blamed whenever the cat behaves badly. In that case, I believe the cat had mistaken her for one of the dogs who will occasionally put their nose through that part of her fence. The cat is always docile and affectionate toward us both. A few weeks ago, the Discovery Channel aired a program devoted to tigers. In one segment, a disgruntled tiger made a swat toward the other catching him/her in the chest area. When the camera showed a close-up of the resulting wound, it was most clearly one single large puncture. I think standard logic would tell us that if a domestic cat can deliver a scratch, a big cat could deliver a bigger scratch. This most definitely doesnt happen. The bigger the cat, the larger the claws, and the large claws are more blunted than the small ones. Feline claws are much the same design as fishing hooks. I have no idea the origin of fishing hooks, or who invented them, but I have every suspicion that they were patented from the idea of cat claws. One might easily be scratched by a small fishing hook but unlikely by a giant one. Just as the hook, a cat's claw is designed to puncture, penetrate, and hold. When the cat must rely on his claws as a weapon, he will punture and pull back, or allow his opponant to pull back. Either way, the result is either a puncture or rip, but not a cut. The claws themselves have no design for cutting, only ripping. The scratch from a small cat is the same as a rip from a big one. I have seen what a leopard paw will do to the head of a male baboon, and met a Zambian boy who had his face swatted by a leopard - it had almost wiped the right side of his face away. A few nights ago, the National Geographic Channel presented a documentary on the African leopard. This was one of the best ones I've seen as it showed some very good close-ups of the methods leopards employ in their killing techniques. In one example, a leopard was shown inflicting the killing bite into the neck of a young gazelle. In the close footage, the canine teeth of the cat were shown having one side deeply imbedded in the flesh, while the other was completely exposed. This is typical of the way animals bite, and contrary to what many believe. When cats and dogs bite into flesh, rarely will both canines penetrate. Instead, pressure is asserted to one or the other side, allowing the upper and lower canine to puncture more deeply. The image above shows the bite of a bobcat along the lower front leg of a medium sized dog. The two punctures would suggest that the upper-canines penetrated the skin, and the relative distance may very well match the dentation of a cat. However, that conclusion would be incorrect. Once these two wounds are closely examined, it can be seen that the punctures were entered at different angles. To the left side of both punctures is a slight abrasion of the skin. This demonstrates that the bite itself was caused by the upper and lower canines on the right side, while both canines on the left never entered the flesh, but caused the marked abrasions. 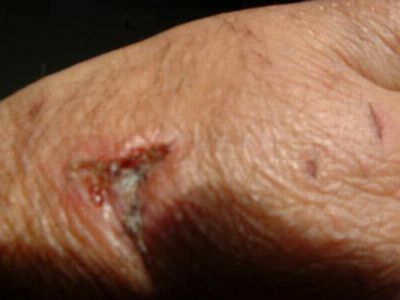 This type bite is typical of both cats and dogs. Rather than inserting both sides evenly, as we do in casting dental impressions, animals favor one side. This is done for the purpose of a more deep penetration of the tooth. If both canines are inserted at the same depth, we would see imprints of the inscissors as well. In any case, attempting to match bite-marks against the teeth of an animal can render some very deceiving results. This may be even more true with sheep or long haired animals as the more latent marks are less visible.